Becoming a roofer can be a very important job and one that can provide a life-long career for those who do well at it. Some roofers work directly with customers in their own business while others work within companies providing service. Individuals considering entering into this career may find that the process is one that includes education and training, but also one that can be entered into quickly. Before getting started, consider this information on how to become a roofer. The job of a roofer may seem very straightforward, but that is not always the case. Roofers work long, hot hours often times on very high platforms doing significant physical labor. However, this physical component of the job is just one aspect of it. The job’s basic skills require individuals to cut, place, secure, and remove roofing materials from the structure in order to create a water-tight, breathable layer that protects the home from the elements. Residential and commercial services differ somewhat, but the aspects of these jobs are about the same in both areas. Roofers also must learn mathematics, sciences, and specific trade skills. They need to know how to spot damage and potential weaknesses in the structure. They must be able to meet the various building codes set forth by city or other inspectors as well. In addition to this, roofers also must be good with working with others, especially if they plan to work as a management level employee or run their own roofing business. In all cases, they have to be able to handle significant physical labor. 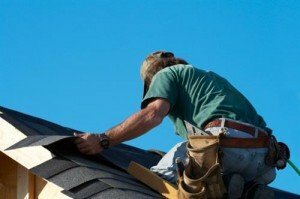 Some roofers also work for government agencies and insurance companies. They may work as a part of a building company. In these positions they often provide inspection skills that help these organizations make decisions about the safety and condition of the structure. In some areas, roofers must hold a license to provide their skills. In most cities, roofers working as a business or a skilled provider will need a business license to operate in that city. The rules regarding certification will differ from one state to the next. The best place to learn about any specific qualifications are local roofer’s unions and professional groups that help these individuals to not only become established, but to handle the various components of the job. In most cases, a roofer will learn his or her trade with on the job training. However, this may not be enough. Many people will first complete their high school education or earn the equivalent of a diploma. They may be able to enter into a trade school for the education necessary. Trade schools may or may not be necessary depending on the state the individual plans to work in and the type of job he or she plans to do. Many times, individuals will need to enter into an apprenticeship. According to CalApprenticeships.org, apprenticeships ensure the individual gets ample education and training. This makes the individual more desirable to those roofing companies looking for experienced professionals. In terms of the future of this field, there is likely to always be a need for trained and skilled professionals in this industry. The Bureau of Labor Statistics indicates that the 2010 median pay for someone working as a roofer was $34,220. This is about $16.45 per hour. In terms of demand, the agency states that from the timeframe of 2010 through 2020, about 24,400 jobs are likely to be added to payrolls in this field. This is about an 18 percent growth and it is about average. Individuals interested in this type of work may wish to learn more about the actual day-to-day job before applying.